The 2013 GreenArrowTV Awards – Time For Nominations! GreenArrowTV wants your help narrowing down the nominees for the 2013 GreenArrowTV Awards. Back during summertime hiatus in the Smallville days, we would do the annual KryptonSite Awards — acknowledging the best and worst of the previous year’s worth of episodes of that series. 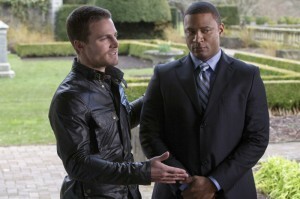 Now, we’re doing the same thing, this time with Arrow… but before we start… we need your help! Since there were 23 episodes in Season 1, and that would mean some very long polls unless we narrowed things down a bit, we’re looking to the GreenArrowTV community for help in narrowing things down. More specifically, we’d like your nominations in certain categories! (Certain areas like “Favorite Character,” “Best Writer,” “Best Director,” and “Best Actor” are already covered). So, take a few minutes to fill this out and we’ll start the voting process very soon with the final results to be unveiled later in the summer, before Season 2 begins! Thanks in advance for your help in narrowing things down.